Trigeminal Nerve is a mixed nerve consisting of both the motor and sensory fibres but mainly it’s sensory. It is the 5th cranial nerve. It includes three large nerves: ophthalmic, maxillary and mandibular, therefore the name trigeminal nerve. It’s a motor nerve to the muscles of mastication and many small muscles and the main sensory nerve of the head and face. It’s the largest cranial nerve. Its sensory ganglion (largest in the body) lies inside the cranial cavity (cf. all the sensory ganglia are situated outside the cranial cavity). Special visceral efferent fibres: They supply the muscles originated from the 1st pharyngeal arch, viz. the muscles of mastication, mylohyoid, anterior belly of digastric, tensor palati and tensor tympani and originate from motor the nucleus of the trigeminal nerve in the pons. They carry exteroceptive sensations (i.e., pain, touch and temperature) from skin of head and face, mucous membrane of mouth, nasal cavity, meninges, etc. and terminate in the main sensory nucleus and spinal nucleus of the trigeminal nerve. They also carry proprioceptive sensations from the muscles of mastication, temporomandibular joint and teeth and terminate in the mesencephalic nucleus of the trigeminal nerve and the reticular formation of brainstem. The exteroceptive neurons are pseudounipolar and their cell bodies are found in the trigeminal ganglion. The proprioceptive neurons are unipolar and their cell bodies can be found in the mesencephalic nucleus of the trigeminal nerve. The mesencephalic nucleus is the only site in the CNS which includes unipolar neurons/first-order sensory neurons. The trigeminal nerve appears by two roots (a smaller medial motor root and a bigger lateral sensory root) from the ventrolateral aspect of the pons at its junction together with the middle cerebellar peduncle. The sensory root enters forwards and laterally over the apex of the petrous temporal bone to go into the middle cranial fossa. Here it presents a rounded enlargement, the trigeminal (gasserian) ganglion. The ganglion inhabits a dural invagination in a shallow fossa on the anterior surface of the petrous temporal bone. The subarachnoid growth over this portion of the trigeminal nerve is named Meckel’s cave. The sensory root could be cut here to be able to alleviate the pain of trigeminal neuralgia. 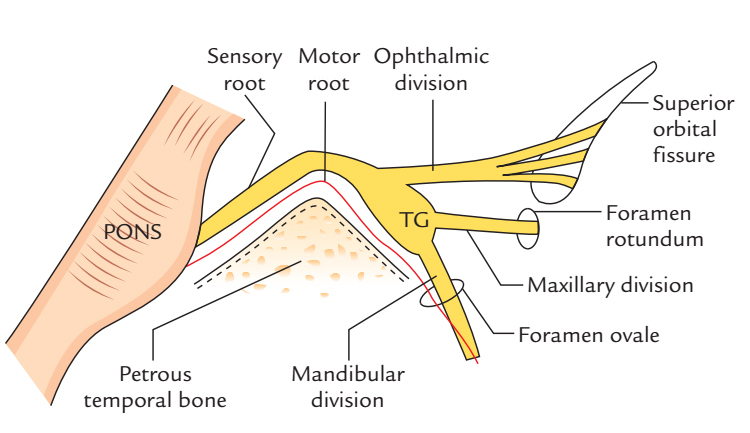 The ophthalmic nerve (only sensory) originates from the anterolateral aspect of the ganglion and enters the lateral wall of the cavernous sinus where it is located below the trochlear nerve. In the cavernous sinus, it breaks up into 3 branches: nasociliary, lacrimal and frontal. All these branches goes into the orbit via the superior orbital fissure. The maxillary nerve (just sensory) originates from the ganglion and enters the lateral wall of the cavernous sinus where it takes up the lowest position and leaves the cavernous sinus to goes into the pterygopalatine fossa via the foramen rotundum. The mandibular nerve (the largest section) originates from the trigeminal ganglion and promptly enters the temple fossa via the foramen ovale. 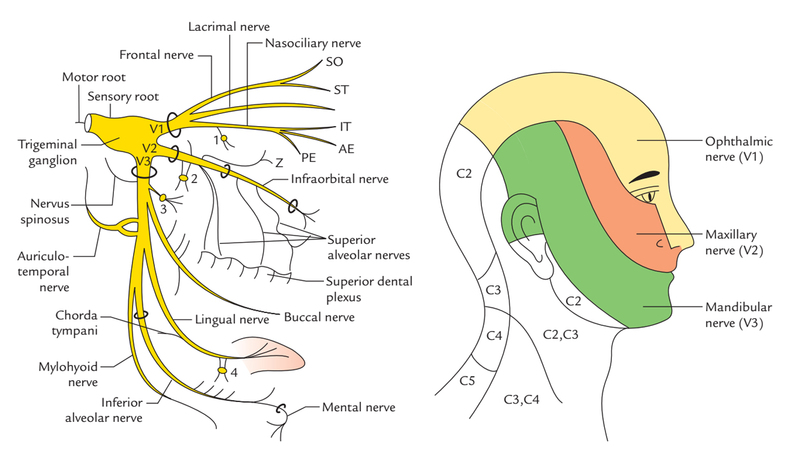 The motor root of the trigeminal nerve after appearing from the pons enters forwards and laterally deep to the sensory root and trigeminal ganglion and enters the temple fossa via the foramen ovale. After appearing from the foramen ovale, it instantaneously joins the mandibular nerve and so the mandibular nerve includes both the motor and sensory fibres. (mixed) Sensory: Lower third of the face (except the small area over the angle of mandible) including part of auricle, temple. It’s a clinical condition which presents itself as paroxysmal episodes of acute pain of sudden onset and brief duration in the area of distribution of 1 or more of the 3 sections of the trigeminal nerve. The ophthalmic division (CN V1) isn’t typically included. 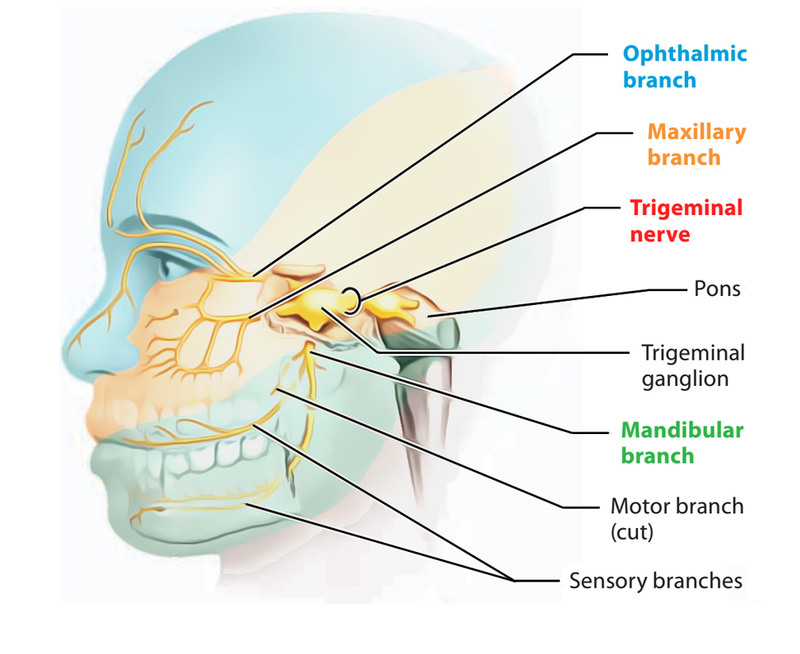 The most often trigeminal neuralgia is connected with maxillary (CN V2) and mandibular sections (CN V3) of the trigeminal nerve. It’s commonly related to dental caries.